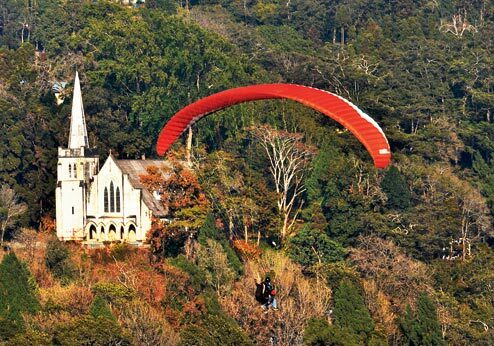 Kalimpong: The Sikkim Paragliding Association (SPA) will organise the first international competition in Gangtok from December 17 to 21. About 125 paragliders from the country and abroad are expected to take part in 1st Sikkim Paragliding Red Panda International Accuracy Open Championship, which is a first of its kind in the region, including Kalimpong and Darjeeling, where paragliding is gaining popularity as part of adventure tourism. The organisers said the championship had been sanctioned by the Federation Aeronautique International (FAI), and this could go a long way in putting Sikkim on the paragliding map of the world. "Our aim is to promote Sikkim as a destination for adventure tourism and put our state on the map of the paragliding world," said Manoj Kumar Chettri, the SPA spokesman. Raju Rai, the SPA technical head and an international paraglider himself, said the competitors would be judged on the basis of precision landing. "Each participant will be given six tries to land on the designated landing spot. They will be judged on the basis of the precision of their landing and consistency," he said. SPA president Raj Kumar Subba said the entry was open for 125 paragliders from across the globe, but 75 per cent of the participants must be from India. "The entry fee is 150 Euros for every participant and they can register at skpa.org," he said. To add colour to the championship, he said, cultural events and local food stalls will also be set up at the Khel Gaon complex. Earlier in the month, Sikkemese woman Cheden Bhutia had become the first paraglider from the state to win a medal in an international event. She had bagged the bronze in the cross-country event at the Open International Paragliding Competition in Nepal.